Fig. 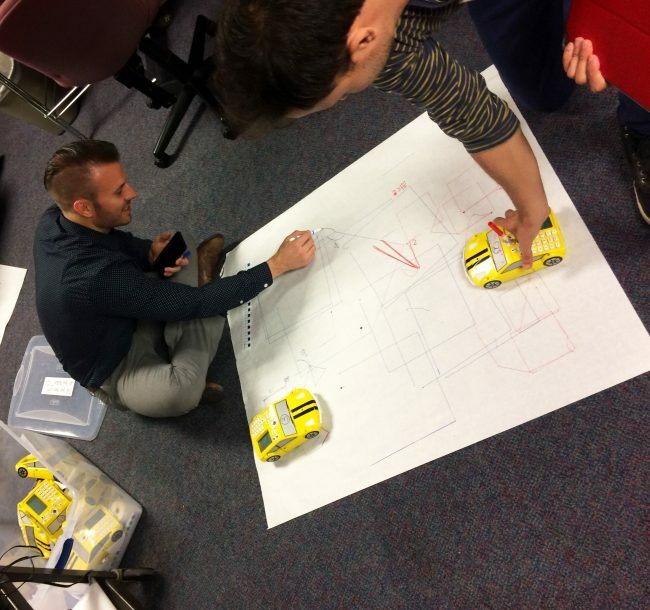 : 1. teachers program cars (probots) so they can draw on paper, creating opportunities for students to learn math and programming while creating visual textures. 2. educators try to understand parts, purposes and complexities by breaking apart an object. I get into an Uber and we are driving from San Jose to Palo Alto. Along the way, the well-developed highway somehow enhances the iconic brands made famous worldwide as symbols of the Silicon Valley. I can spot a gigantic rocket-shaped building within NASA’s complex. I see a road sign indicating “Mountain View” that way, and I’m reminded of the headquarters of Apple, Google, and Facebook. I think I have arrived. 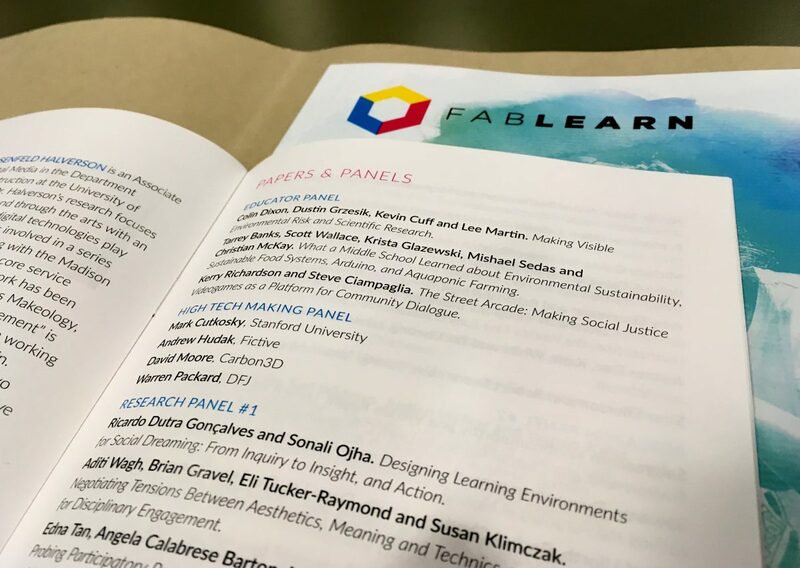 It is the first day of the Fablearn Conference 2016, at the Graduate School of Education at Stanford University, and I am here to present a paper, that came out of my thesis in the MFA in Transdisciplinary Design, at Parsons School of Design, New York. The whole scene feels quite surreal. For some matter of fact, the Silicon Valley seem to be already living in a future 30 years ahead from most places on earth. Particularly in terms of how it is approaching the information era or revolution, as they call it there. Coming from a design background, but working with education – one of my dreams has been to immerse myself in centers of excellence in learning, share my thesis work and see how people respond. That was the chance given to me by Stanford, during Fablearn 2016, a conference bringing together designers, programmers, technologists, scientists, and educators to learn and debate the maker movement and its possibilities within K-12 education. Fig. 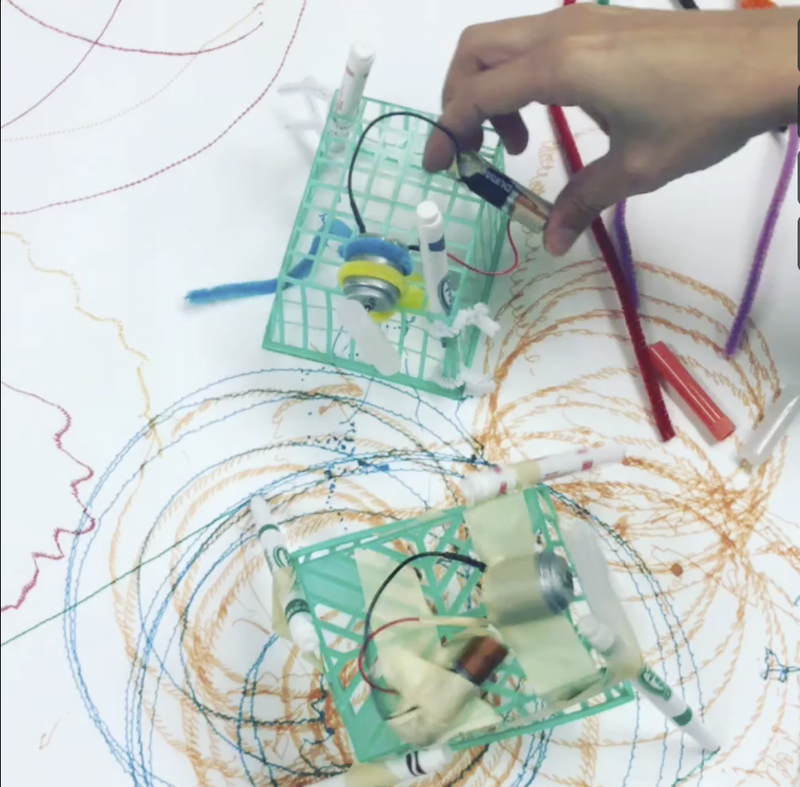 : animating objects through simple circuits and batteries is a common learning experience within the maker education. Our first two days have been spent at a Maker Space, within a local school for girls, in Palo Alto. 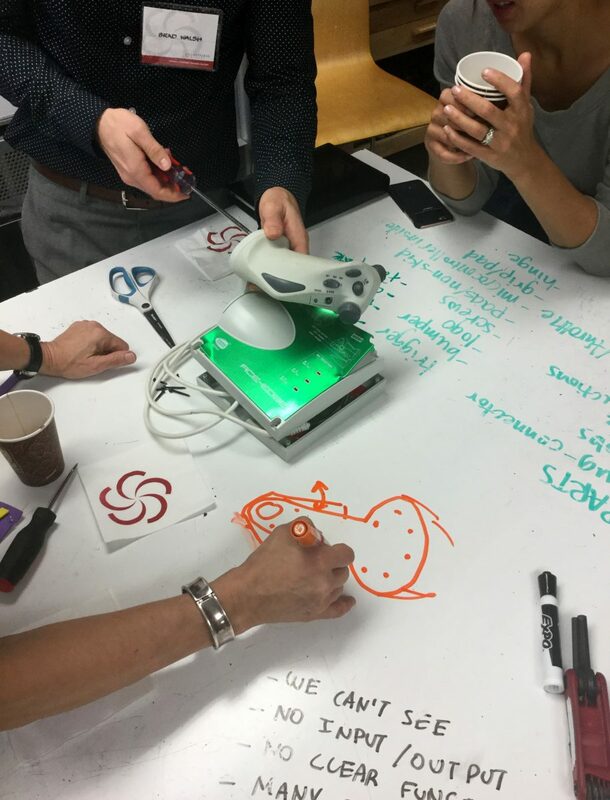 Their educators led a workshop on “How to Design Maker Spaces”. I was so eager to learn from such a resourceful place, that immediately I turned on my hyper curious self – and blended in with other dozens of teachers coming from across the U.S. and the world. However, it didn’t take me long to notice how many light-years ahead such an elite school in the Bay Area is, if compared, for instance, with the public school my niece attends in Brazil. In Palo Alto, the school has been designed for girls not because of someone’s fancy wishes, but based on research coming out of Stanford saying that girls studying with other girls can succeed further in professions that are usually overtaken by men, particularly in technology and engineering. During the conference I have witnessed kids doing outstanding things with technology (here, meaning from cardboard to early prototypes of robots). I saw a 12-year old Californian boy who had built an immersive airplane experience using projection and programming. A 10-year-old Thai girl who built a drone from scratch and sent it across Bangkok to collect images. Stanford and the MIT Media Lab are really positioning this as a maker revolution, towards a future in which school computer labs will be replaced by maker spaces. And that is already happening in major cities across the world. However, the question is what is making and how does it enable us to build societies we want? Fig. Thesis Paper – Designing Learning Environments for Social Dreaming: from Inquiry to Insight, and Action. This question that almost “slows down” the makers can be received with quite some surprise. However, I was glad to see a MIT Media Lab senior professor raising it in the first day when she provoked the audience by asking “how might we create a culture where being quiet, observant, thoughtful, and contemplative strikes a balance with being a doer, entrepreneur, mover, and shaker?” – a well positioned question, coming from someone who herself had been taught by Jean Piaget and Seymour Papert, icons of constructivism and the maker movement. Her question gave me the confidence to put forth my ideas on social dreaming, the core theme of my article. In my presentation, I shared examples of how participatory processes could be used to engage educators and learners in building a world they want to be a part of. Here, making is not only for the sake of “how cool it is”, but because at the root of making is one’s capability to re-shape the world. *Full article presentation can be watched here, at 07:12. Ricardo holds a MFA in Transdisciplinary Design from Parsons The New School for Design (New York). He cofounded Flip it Forward, an action research and future-making studio leveraging design, technology and social emotional development within the maker movement and K-12 education. He also consults with organizations such as the Education Design Lab, and MIT’s Presencing Institute.